When it comes time to resell your fleet vehicles, choose Foss National. We are experts at the many factors that affect auction results, as our results prove: we lead the industry in consistently earning higher resale prices and faster turnaround for our clients—which directly lowers your total fleet costs. Reselling a fleet of vehicles is a job best left to experts. Without industry connections and years of experience, how do you know the most effective sales strategy? Common questions—like reselling a vehicle to an employee—an have legal and tax implications. How do ensure that regulations are followed? Even more important: do you want to devote your valuable staff to the task of selling your vehicles? Why not free your staff to take care of your business, and let us take care of the resale? The experts in our Vehicle Remarketing Management service understand the resale industry like no one else. Can you make more money by timing the resale of your fleet vehicles? 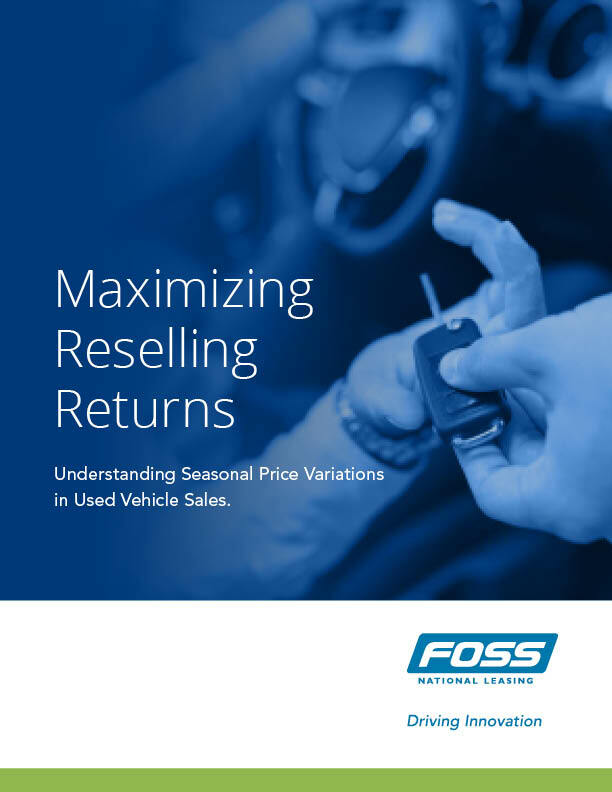 This paper explains seasonal trends and provides tips for the era of online vehicle sales. While online sales have changed the buying market, there are still seasonal variations in used-vehicle prices. This paper shows the factors in play, including the online market’s effect on pricing trends. Industry data proves that Foss National consistently sells fleet vehicles for higher dollars in less time—even vehicles with higher kilometres. The Foss National brand on used vehicles is recognized and respected throughout Canada. We have an excellent reputation with wholesalers and auction houses. e apply the most effective sales strategy, from online Internet sales to wholesalers and auctions—for your specific fleet and market. When we sell your vehicles, we consider the many factors that could affect your sales success: the type of vehicles, age, condition, kilometres, and the time of year, location of sale, transportation costs and many other considerations. Foss National is respected for our integrity and honesty, which attracts more bidders, and results in higher prices. For on our maintenance control programs, we provide vehicles’ full maintenance history, for complete transparency on the vehicle’s history and conditions. Buyers will pay more for a vehicle when they can trust its condition. We provide CarProof Vehicle History Reports—in fact we were one of the first to offer this level of detailed disclosure. We can handle the details of selling leased vehicles directly to your employees, in fact, about half of our fleet sales go to employees. Often this is a win-win situation: the resale price is higher, which benefits the company, while the employee pays a price that is lower than retail. Vehicle write-offs can be a challenge to sell, but not for Foss National. Our team has the network and processes to get the top dollar for your write-offs and salvage vehicles.